Remembering Roy and Leaving a Legacy! This afternoon I’m at my home office computer watching the live stream Memorial service for one of the men who encouraged me in ministry. 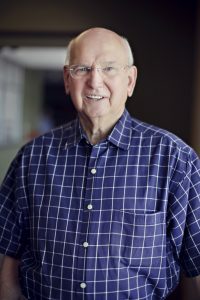 His name is Roy Wheeler and he served in Amarillo, Texas for over 40 years as the Senior Minister for Hillside Christian Church. (Known as Paramount Terrace Christian Church when I was growing up) My first two suits came from Roy and those are a necessity, at least back then, for being a preacher. Roy came up to Joplin, Missouri in April of 1994 to hear my senior sermon and participate in my ordination service for full-time Christian ministry. Later on that day Roy said he was so impressed with my sermon that he wanted me to come back to Paramount Terrace and preach it for all three Sunday morning services before Debi and I left for Moscow, Russia as missionaries. I wanted to make the memorial service today but with all the Hurricane relief that our Houston area church is engaged in, I just couldn’t make it happen. I’m sure that among all the people who were in attendance, there will be a number of men, like me, who owe part of their journey in Christian ministry to Roy. While it was Jesus who truly called me to this task, it was Roy and men like him who confirmed it. For that I am ever grateful. This afternoon is indeed one of those times in the race of our lives when we do stop and think about those who have been a positive influence on us. For me, I’d say that the “A Team” list of older mentors in my life, who have encouraged me in ministry, would be Eric Wolfram, Max Goins, Mark Scott, Fred Masteller, Dennis Platt, Bob Gerhardt, and Steve Sigler in addition to Roy. Maybe for you, today can also be a time to remember, thank Jesus for, and possibly reach out to those who have encouraged you. Likewise, as we live in such a negative culture today, the positive power of the tongue is such a rarity. I often ask myself whom I might encourage like these men have done to me. What about you? The reality is that all of us will be at center stage of a funeral or memorial service someday. At that time, who will be stopping and thanking Jesus for allowing you to be a positive influence in their lives? Thanks for your input men. I was reminded from the live stream of the memorial something Roy said once. That’s how I summarize it anyway. Roy was a true warrior for the kingdom of God. He set the standard high for work in the kingdom. He was a great example to follow, as he followed faithfully his God. We all will miss his presence, but know we will see him again one day. When we all get to heaven. Such is Love’s nature. Ripples upon ripples on the lake. Roy’s ripple reached me through you. I’m Blessed.